Colorado teachers rally on April 16 outside the state Capitol to demand more funding for schools and oppose changes to the state's pension system. Thousands of teachers across the state are expected to walk off the job tomorrow. That's after Arizona educators voted overwhelmingly last week in support of an organized protest. Their demands include an increase in school funding — enough to return to pre-recession levels — and a big lift in salaries, enough to get them to the national average of $58,950. In 2016-17, Arizona teachers earned $47,403, on average. "I think that educators are ready to stay out for the duration and force legislators to strategically invest in our schools the way that we did ten years ago," Joe Thomas, president of the Arizona Education Association, tells NPR. AEA, the state's largest union, is working hand-in-hand to coordinate the walkouts with Arizona Educators United, a grassroots organization behind the state's #RedforED movement. "The educators of Arizona sent an incredibly strong message," Noah Karvelis, spokesman for Arizona Educators United, tweeted after the walkout votes were tallied. "We will not allow our legislature to neglect our students, families and educators any longer." In an attempt to avert a walkout, Gov. Doug Ducey, a Republican, promised teachers a 20 percent pay raise by 2020, tweeting: "I am committed to getting teachers this raise and am working to get this passed at the Legislature. We need teachers teaching, and kids learning." The governor's office says the money would come from a combination of increased revenue and small cuts. In a fact sheet, Ducey's office explains that the state can spend more money on schools and teachers because "revenues are on the rise and have been higher than originally projected, combined with a reduction in state government operating budgets through strategic efficiencies, caseload savings, and a rollback of governor's office proposals." But Thomas and Karvelis — and the teachers they represent — aren't buying that explanation. "No funding tricks, no one-time fixes, no smoke and mirrors" says Thomas, "our teachers were absolutely disgusted." He and Karvelis rejected the governor's proposal because, they say, not all teachers would receive pay hikes — and the money for those that would get them would come at the expense of other important programs. Teachers in Colorado are also set to walk out Thursday or Friday. Several hundred showed up at the state Capitol last week to voice a range of familiar concerns. Teacher pay in Colorado is relatively low. The average teacher salary is $46,506, compared with $58,950 nationally. According to one study, the state ranks last in wage competitiveness. Also on teachers' list of complaints: underfunding of schools and efforts to scale back pension benefits. 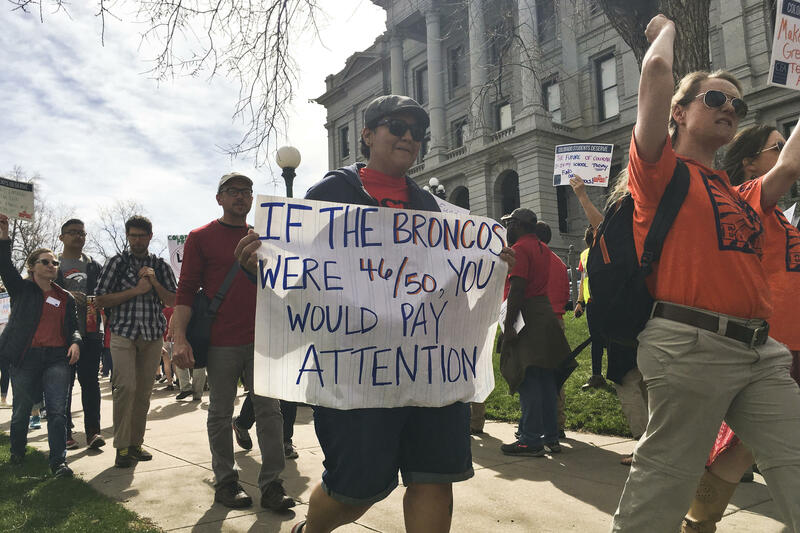 But there are a few important differences between Colorado and the other states that have seen teacher protests. And those differences mean that lobbying lawmakers for a salary or funding increase isn't as straight-forward here — even with the support of Gov. John Hickenlooper, a Democrat. "It required that voters, not lawmakers, have the final say on tax increases, and it capped tax revenue. Anything the state raised over that cap — typically in boom years — would be refunded to taxpayers." In short, teachers have to take their funding arguments to the people. "It's gotta be a ballot," says Kerrie Dallman, president of the Colorado Education Association, the union that represents 35,000 educators across the state. While previous ballot measures to raise school funding have failed, Dallman says Colorado teachers will try again in November. Another big challenge for teachers boils down to two words: local control. Even if lawmakers are willing to repurpose money from elsewhere in the state's budget to raise teachers' salaries, Dallman says, they can't. Not easily, anyway. "We don't have a statewide salary schedule, and so, when new money is freed up, it really is up to a local school district whether or not they want to agree to a raise," says Dallman. "That's the beauty of local control." While protests are just gearing up in Arizona and Colorado, the dust is settling in Oklahoma. Though the outcome, and what to make of it, is still in dispute. Teachers walked out on April 2, hoping to win increases in school funding and more pay for support staff. Lawmakers passed a $6,000 pay raise for educators in late March — before the walkout had begun. After striking for nine days and winning no new concessions, teachers returned to their classrooms. The move, which was supported by union leaders, frustrated some protesters. "In reality, we are truly, literally in a worse position than when we started," says Larry Cagle, who leads a grassroots teachers group called Oklahoma Teachers United. "The unions were horribly complicit in this meltdown." Cagle says independent teachers led the way to the strike but made a mistake allowing the state's largest teachers union, the Oklahoma Education Association, to negotiate on their behalf. He worries that the new money lawmakers have promised teachers simply won't materialize. Ed Allen, leader of the Oklahoma City chapter of the American Federation of Teachers, says that's not something teachers need to worry about. It's up to lawmakers, Allen says, to follow through on the deal, and, "if the money isn't there, they are going to have to find the funds to pay for it." The unions aren't completely satisfied with the strike's outcome either. "Quite frankly, we're angry that the legislature — the Senate in particular — wasn't willing to talk about funding any more for education," says OEA President Alicia Priest. "That is an indictment on our legislature, and that's where the anger should be directed." Still, union leaders say, these walkouts did achieve something. Priest says the bill to raise teacher pay is part of the OEA's three-year plan to make up the $1 billion in education funding that has been cut in the past decade. Politically, the Oklahoma strike tested union strength and credibility in a state where employees can't be compelled to join a teachers union or pay union dues. More than half of all states are so-called right-to-work states — including Arizona, Kentucky, and West Virginia. "It has been harder and harder to draw our younger teachers into the union and see the need for the union," says Allen of the Oklahoma City AFT. But, he believes, "it's a teacher's cost of doing business, your union membership." For Cagle, though, the experience provides a cautionary tale for other states considering a walkout: "If there's one thing that Arizona needs to know today — it's don't give the union the mic. Because they're not powerful enough." The fight here isn't over teacher pay, exactly, but teacher compensation. A pair of studies — here and here — show teacher salaries in Kentucky are more competitive than they are in either Arizona or Oklahoma. But the commonwealth's pension system is in trouble. Its unfunded obligations have ballooned in recent years, and lawmakers have struggled to contain them. "Over the last 10 years, they have essentially doubled the amount of money they're putting into the pension plan, and it's still not enough," says Chad Aldeman, the editor of teacherpensions.org. Recently, Kentucky's Republican governor, Matt Bevin, warned: "If we don't change anything, the system will fail, and most of the people now teaching will never see one cent of a retirement plan." So, in a surprise move last month, Republicans fast-tracked a dramatic reimagining of the state's pension system, including something called a cash-balance plan for new teachers, by attaching it to a sewage bill. "The biggest difference is, with the existing plan, you know exactly what your retirement is going to be before you retire," says Beau Barnes, general counsel for Kentucky's Teachers' Retirement System. Under this new cash-balance plan, which is somewhere between a traditional pension and a 401(k), Barnes says teachers won't know how much money they'll receive each month until they leave the classroom. In short: It introduces a new level of uncertainty in a state where teachers don't enjoy the safety of Social Security. When teachers realized this was happening, thousands converged on the Capitol in Frankfort to protest the pension changes. While these changes are here to stay, Republican lawmakers did override the governor's veto of a new, two-year operating budget that increases per-student spending, in part, by raising the state's cigarette tax. And finally, the beginning: A statewide strike in West Virginia ignited the movement by teachers around the country. On Feb. 22, educators left their classrooms, demanding higher pay and relief from rising health care costs. Teachers didn't head back to class until March 7, a day after the legislature passed a 5 percent pay raise for all state workers, including teachers. The governor has also convened a task force to explore ways to rein in health insurance costs.